For THE END opera that will be held on December 1 and 2 at the Yamaguchi Center for Arts and Media in Yamaguchi City, director Toshiki Okada and digital music artist Keiichirō Shibuya decided to collaborate with French fashion brand Louis Vuitton. Louis Vuitton artistic director Marc Jacobs is designing the outfits that Vocaloid idol character Hatsune Miku will wear onstage. No humans will appear onstage during the opera, even to play the instruments. Instead, Vocaloids will take their place, taking over every aria and recitative. The "actors'" onstage images are designed by artist YKBX (also known as Masaki Yokobe), who is known for his video "amazarashi." Shohei Shigematsu, an architect and a partner of OMA New York, is designing the stage. 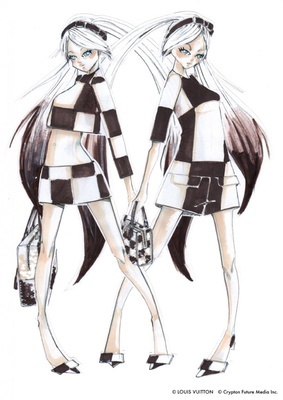 The clothes Hatsune Miku will wear are clothes based off of Mark Jacobs' spring/summer 2013 collection that were altered in order to fit the virtual singer's body type and unique style. As this is the very first time that outfits from Louis Vuitton will lack the label's signature monogram symbol, the outfits will instead be using a pattern similar to theLouis Vuitton's familiar diamond pattern. The purses have been altered from the standardLouis Vuitton bag into cubical and square shapes to accentuate to the geometric themes. Tickets were available for pre-order for 3,000 yen (about US$37), but were sold out as of November 14. Louis Vuitton also collaborated with modern artist Takashi Murakami on his Superflat Monogram and Superflat First Love anime.